Leading Rabbi pleads with Christian leaders to fight abortion and gay agenda in Holy Land | RabbiLevin.com - Fighting for Morality! 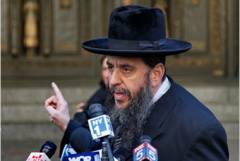 March 23, 2012 (LifeSiteNews.com) - Rabbi Yehuda Levin, an Orthodox Jewish leader who often functions as a spokesman for the Rabbinical Alliance of America and the Union of Orthodox Rabbis of the U.S. and Canada, is calling on Christian leaders to take a more active role in defending Israel from pro-abortion and homosexual activist ideology. In a recent interview with LifeSiteNews.com he spoke of “Christian Zionists” who support the state of Israel politically and even economically. Levin said that they are ignoring spiritual issues of great importance in what both Jews and Christians refer to as the Holy Land, including the mass murder of the unborn, as well as the “homosexualization” of Israeli culture. Although a minority of more traditional Jews oppose these trends, said Levin, they are generally mistreated by a secularized majority, and are receiving little support from other religious groups who share their values. “While there are tremendously devout people in Israel, Hasidic people, what is referred to as ultra- Orthodox, on the other end of the spectrum, among the irreligious Israelis, we see an eagerness, to embrace Madonna, to embrace Michael Jackson, to embrace all the craziness, and it saddens me that the Christian, so-called Christian Zionists, whether Catholic, or whether Evangelical, those who support Israel do not understand that they have a strength” while “we Orthodox that are treated literally like second-rate citizens in many areas in Israel, many areas of social life, we are frowned upon,” he said. According to Levin,“we are in a civil war within the Catholic Church, within the Jewish religion,” and the two groups must support one another in their battles to preserve moral teachings. While expressing his profound respect for New York City’s Cardinal Archbishop Timothy Dolan, Rabbi Levin said that he was “disappointed” with the lack of help from the prelate during the debate over homosexual “marriage” in New York state in 2010, as well as his silence on Israel’s moral problems during Dolan’s recent trip to the Holy Land. “Now of course it might be politically unpopular for him to say this, and it might rankle, but you know how many people would feel inspired, would feel motivated, would feel embarrassed that a foreign clergyman said such a thing?” he asked. Levin expressed his gratitude to Vatican officials for intervening against permitting a homosexual march in Jerusalem in 2006. Rabbi Levin urged Catholic clergy to join with Evangelical, Jewish, and even Muslim leaders, to institute an absolute prohibition against voting for those who support anti-life and anti-family agendas. “Occasionally I go to the Vatican, and whenever I’m there I always tell these prelates that ultimately, we have to draw a line in the sand, and there has to be a teaching from the major religions that it is absolutely positively prohibited to vote for anyone who is supportive of any part of the abortion, homosexual, or anti-religous-liberty agendas,” he said. He expressed admiration for Dr. Richard Land, President of the Southern Baptist Convention’s Ethics and Religious Liberty Commission (ERLC), for his strong defiance of the Obama administration’s coercive contraceptive mandate, which will require religious institutions to fund contraception, including drugs that cause abortions, and urged Catholic leaders to coordinate more closely with Baptists. Levin’s final point, which he regarded as the most important, was that ultimately, responsibility for the decaying morality of modern society lies with religious leaders, who have not acted with sufficient vigor to counteract such trends. I am a 44 year old female Christian who agrees with you in every sense of the word. Many Christians have left the Churches precisely because of this as well as many other things. Please allow me to explain. I have always been under the impression that YHWH's house (Church or Synagogue) was to be a place of worship where we can talk with a Pastor, Priest or Rabbi about devoting our lives to him putting away all sins. While I understand that you don't believe that Yeshuah/Jesus is NOT the Messiah, many of us Christians do. Yeshuah ha Mashiach NEVER did away with the Torah. Matthew chapter 5 verse 20 states "For I say unto you, That EXCEPT YOUR RIGHTEOUSNESS SHALL EXCEED THE RIGHTEOUSNESS OF THE SCRIBES AND PHARISEES, YE SHALL IN NO CASE ENTER INTO THE KINGDOM OF HEAVEN". There are many Christians who want to return to the Torah so we are basically forced to do this in our own home. Some of the pastors/priests are corrupt allowing these sins to continue. Some have closed their churches because of the Govt blackmailing them with the 501c3 tax exemption that if they do not allow homosexuals to preach and be active, they will lose that tax exempt status. We are spit on, ostracized and cursed out by many orthodox jewish groups because of our belief in Yeshuah. That is another reason why Christians are forced inside their homes. 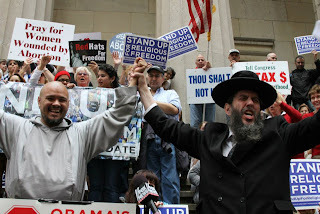 Groups like ADL, SPLC and ACLU attack us Christians all the time when we try to stand up for moral values of the Torah. I have to watch videos from Chabad.org just to learn the Torah because there is not enough Rabbis to help us return to the Torah. Yeshuah never did away with the laws. The ONLY thing that was done away with was the SACRIFICIAL laws. I'm not trying to convert any Jewish person to Christianity at all. As a matter of fact, I'm trying to get CHRISTIANS to RETURN to the Torah, which is exactly why the word of the Lord came and dwelt inside of human flesh. To bring sinners to repentance and bring them back to obeying the Torah. However, getting them to return is an extremely difficult task. Would any TRUE Torah-loving, Torah abiding Rabbis be willing to reach out to the Christians and help those who want to return to the laws, commandments and statutes of YHWH? Many are feeling alienated and isolated. Levin is an abomination. Gay is good! Copyright 2010 RabbiLevin.com - Fighting for Morality!